Panini Gold Standard Ben Simmons 2016-2017 Sixers rookie card. It was never much fun tearing open a pack of sports cards just to get your ordinary Horace Grants and Dana Barroses. No disrespect to either, it's just part of the hunt you sign up for when you're a collector. You need to find the top-shelf rookies or the superstars in a collector's edition. Otherwise, you blew your allowance. Oregon resident Wendell Williams recently got back into the hobby after watching some YouTube videos about NBA cards, according to a story published Thursday by Bleacher Report. He was intrigued by the obsession experts had with an extremely rare Ben Simmons rookie card. Simmons, of course, is the odds-on favorite to win NBA Rookie of the Year (more on that below). He's been instrumental to the success of the young Sixers team that's now powering its way through the playoffs. Williams took his two-year-old son to the local collectibles shop just to buy some sleeves and cases, but found himself tempted to buy a whole box of the Panini's Gold Standard line of basketball cards. He had to drop $150 for them, but why not? 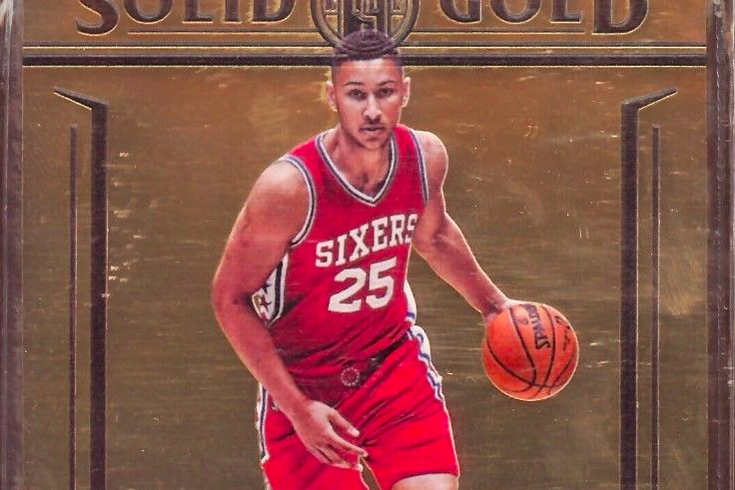 When he got home and flipped through his 12 packs, he hit the jackpot: A 2016-2017 Ben Simmons rookie card made out of 14-karat gold. Williams knew he had something incredibly valuable, so he posted it on eBay expecting to get offers of about $10,000-$25,000. Nope, try a first hard offer of $89,000. The card is now sitting on the Hoody's Collectibles eBay site at a "Buy Now" price of $150,000. Williams said Simmons is his favorite player and he's not yet sure whether to part with the card now or hold onto it as an investment. If Simmons continues to progress into a superstar, Williams could fetch quite a bit more. Ironically, the card is for a year in which Simmons didn't even play. He sat out all of 2016-17 with a foot injury and is now having to shut up rookie truthers who believe Jazz point guard Donovan Mitchell is the best "actual" rookie in 2017-18. Let's hope Simmons leads the Sixers to an NBA title this year and the card vaults up even more in value.